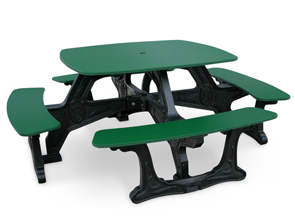 This Bistro Recycled Plastic Table is perfect for small café and quaint patio areas. Ideal for serving modest, down-to-earth food and wine, the square top has rounded edges for safety and comfort. Seating for eight and a large top with ample space allows large groups of friends and family to comfortably socialize for hours. Recyceld plastic top, seats, and frame are hygenic and easy to clean, making this table a simple, ecological choice that is truly visually striking.